Everyone who works should be in a trade union and there is a trade union suitable for each of us. PDAU believe that everyone who is working should be in a suitable trade union for their circumstances so that they receive the support, protection and other benefits of being part of an independent trade union. PDA Union is the only independent trade union in the UK which is exclusively for pharmacists and we welcome pharmacists from across the sector. However, from time to time we are also contacted by non-pharmacist members of the community pharmacy team asking if we will either extend PDAU membership to include them or if we will create an organisation for them which would replicate what the PDAU does for pharmacists. Neither of those things fit within the purpose of PDAU, but we can and do recommend that those other colleagues join another existing independent trade union that is appropriate for their role and for where they work. If you are another member of the community pharmacy team you should first check if your employer already recognises an independent trade union and if they do, we would recommend you find out how to join that union. 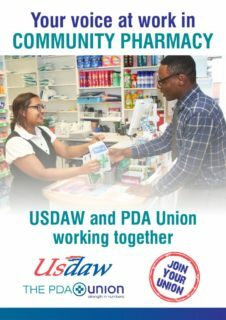 If your community pharmacy employer doesn’t recognise a trade union then we recommend that non-pharmacists look at USDAW who are the leading trade union on the high street in Great Britain.